Worked on it this weekend! I might be able to finish it tonight. I shortened the bodice by 2 cm and added a 3 cm waistband. 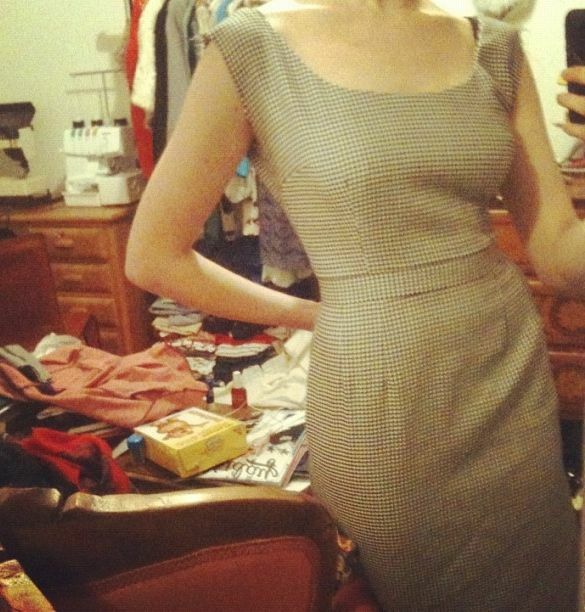 I also made the scoop neckline slightly lower, and lowered the back neckline. All that's left to do is put in the sleeves, the zipper and hem the skirt! And after that, the collar and cuffs of course. I decided I'm not going to line it after all, the fabric isn't itchy, and it comes on and off pretty easily. I did interface the waistband and neckline facing though. I still haven't taken proper pictures of the two dresses I made in October because it's been so dark outside lately, but I'll force myself to do it this week anyway (because by then I'll hopefully have 3 dresses to show! ).